Several pages back, I announced that I was doing a trial run of drawing pages entirely myself-- hence the abrupt style change. (Up until page 117, this was a team effort with Tod Wills providing the pencil sketches that I inked and colored.) I've really enjoyed drawing the comic so far, talked with Tod, and did some serious thinking. From now on, I will be doing Crimson Flag entirely myself. When I originally enlisted Tod's help, I was not much of an artist at all. I've been practicing every day since then, and this is a challenge I am itching to take on. 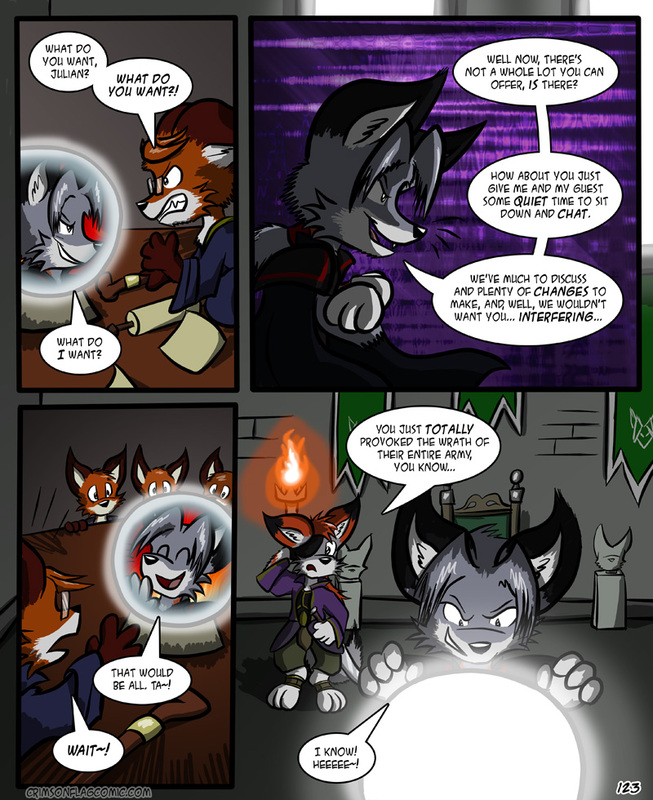 Obviously this is a major change for the comic, since I draw foxes way more short and cutesy than Tod. This is more towards my original vision of the comic though. Thanks for all your support! Tod of course is still around! His main comic, Ekwara updates way more frequently than CF. Also, check out his main website and Livejournal. Thanks for all the help, Tod! I couldn't have gotten this far without you.